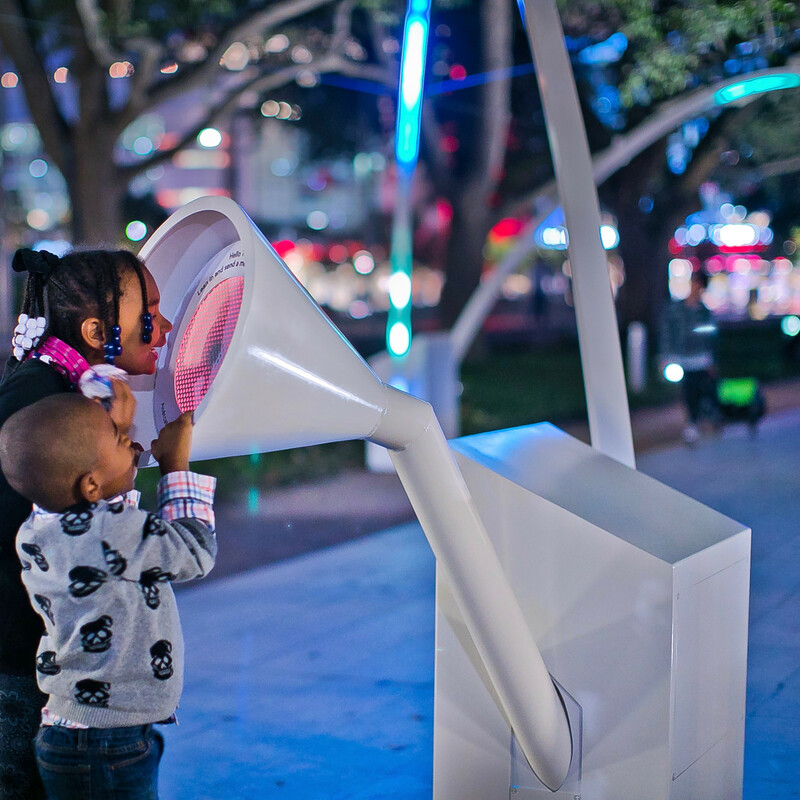 Start your downtown journey at Discovery Green for public art like nothing else in the world. 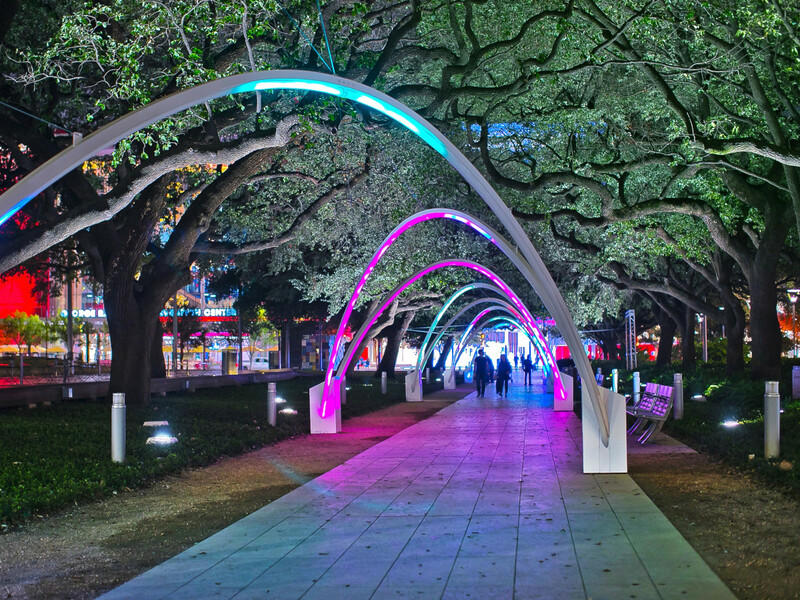 Created by the Montreal-based design studio Daily tous les jours, Hello, Trees is the latest public art installation in Discovery Green but the first commissioned specifically for the park. 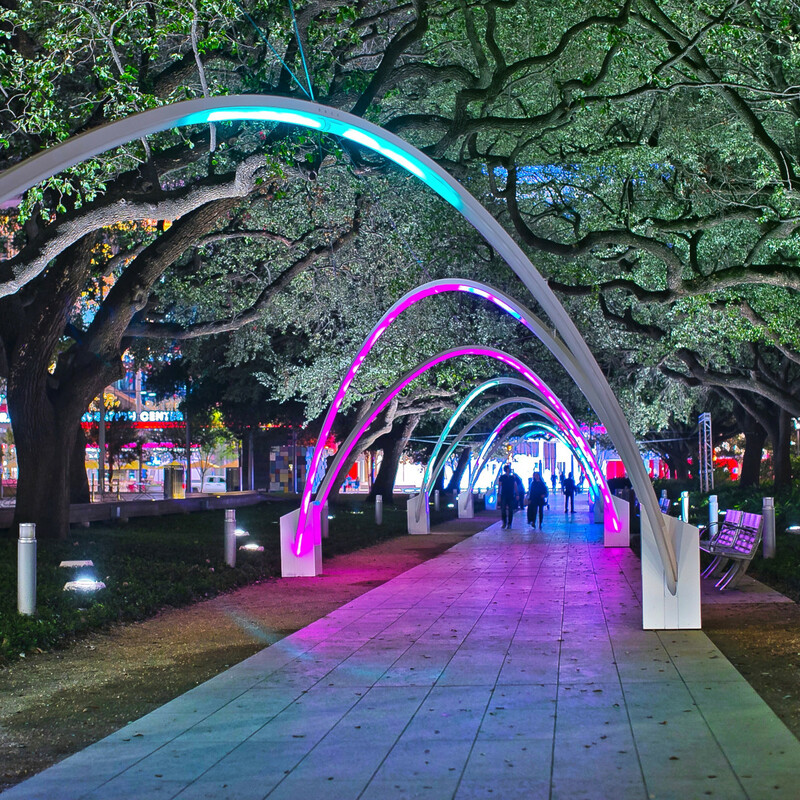 Shaded by the live oak trees, the oldest trees in downtown, a promenade of light arches and sound speakers relay musical and light messages back and forth the along the pathway. Step up to the message station on either end and talk to the majestic trees, a friend or even a stranger at the other end. The interactive artwork repeats your voice back to you before translating it into light and music that moves through the arches. When one message encounters another traveling from the other side, they interact and interweave, creating new music. Artist Mouna Andraos, a Daily tous les jours founder, explained during a media preview of the installation that their inspiration for the project came from discovering how trees communicate through their roots. Though the art group began work on Hello, Trees a year ago, it resonates that community spirit we have all felt in recent months. 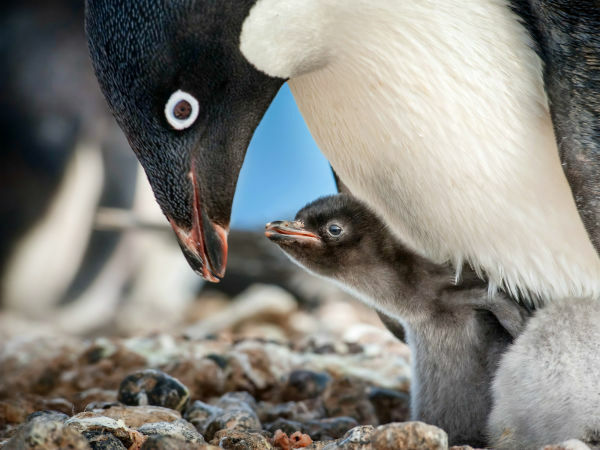 “We try to propose things that inspire people to become active in their environment and more aware of each other. Ultimately if we can create opportunities for conversations amongst people who wouldn’t necessarily have exchanges, then we’re happy,” described Andraos. While these large scale artworks were only scheduled to remain in Main Street Square for about a year, they’ve lingered, with the Downtown District adding and rotating new works into the Blocks. Trumpet Flower still blooms upside down in its cozy niche, while the Main Street Marquee continues to redefine what a urban billboard can become. Rather fittingly, Chun Hui Pak’s Year of the Rooster will reign over Main Street until the end of December. Slow your stride and catch an Art Blocks/Aurora Picture Show installation of film street art at the Sidewalk Cinema with “Inside Out” a collection of short vertical videos. 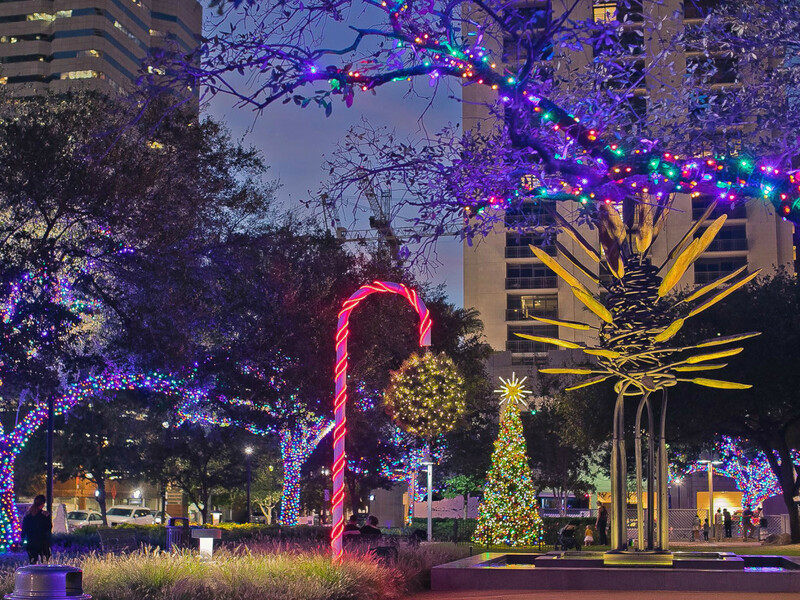 While the Wortham Center has several more months of recovery before it opens again for performances, many a holiday show will go on in the rest of the Theater District and beyond. 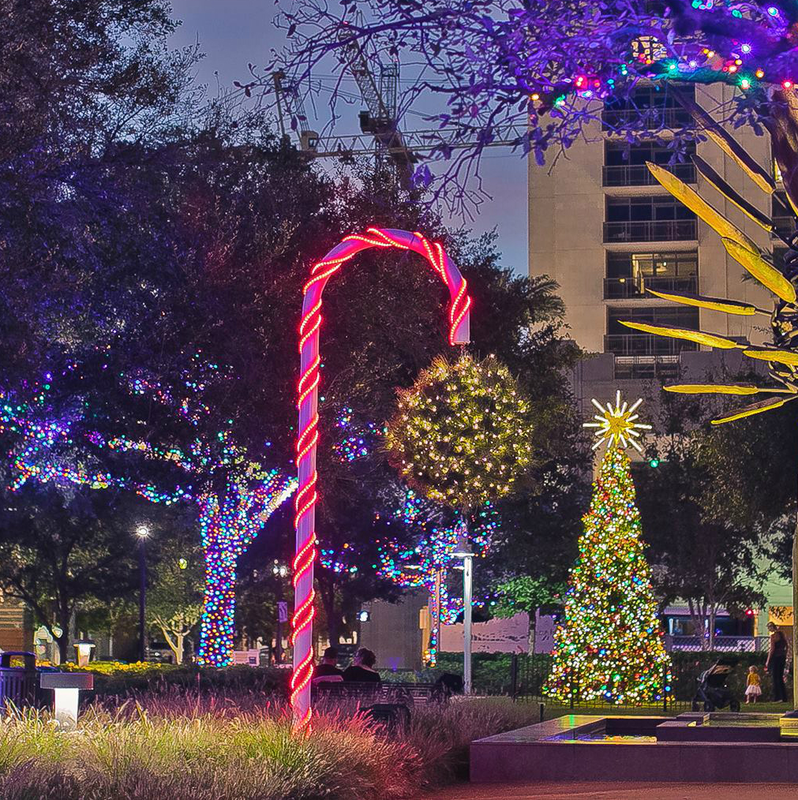 Check our CultureMap roundup of wondrous holiday shows downtown including Houston Ballet’s Nutcracker, Houston Grand Opera’s The House Without a Christmas Tree, the Alley Theatre’s Christmas Carol, Theatre Under the Stars’ Sleeping Beauty and Rec Room’s Hansel and Gretel. And now that Jones Hall has reopened, don’t forget the Houston Symphony’s Harry Potter and the Chamber of Secrets concert (December 29 and 30) to help you get ready for a magical new year. 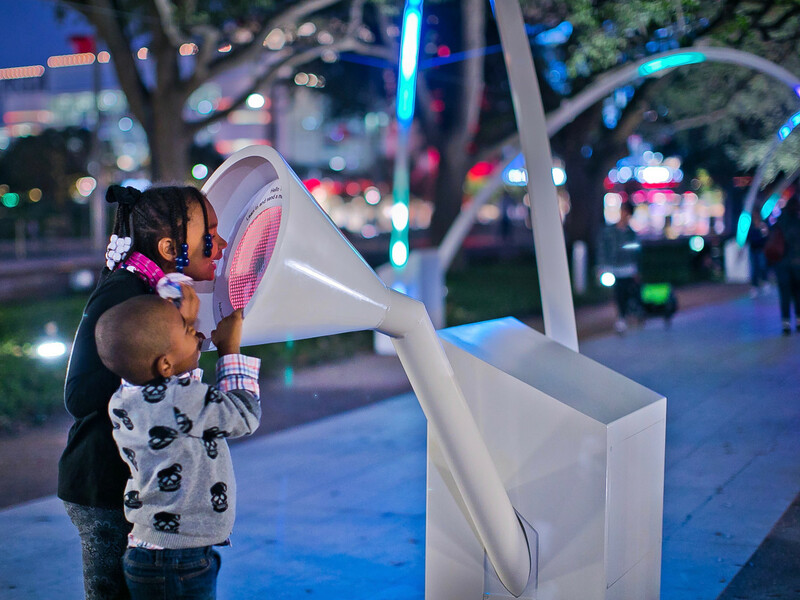 Bank of America Screen on the Green shows family friendly movies at the Discovery Green Anheuser-Busch Stage every Thursday. For the rest of December, catch holiday themed selections with Madea Christmas (December 21), Elf (December 28) and then the animated Leap (January 4) for the new year. 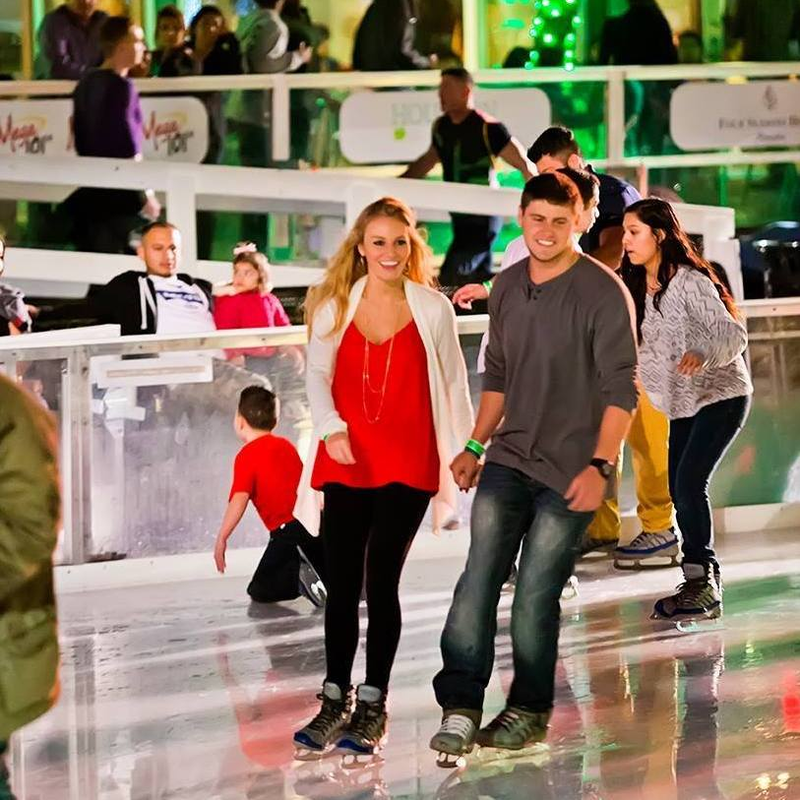 After spending time singing to the trees, take to the ice for a cool skate in the daylight or under the stars. The 7,716 square-foot ice surface, the largest outdoor rink in the Southwest, uses recycled water from Kinder Lake and equipment powered by renewable energy. 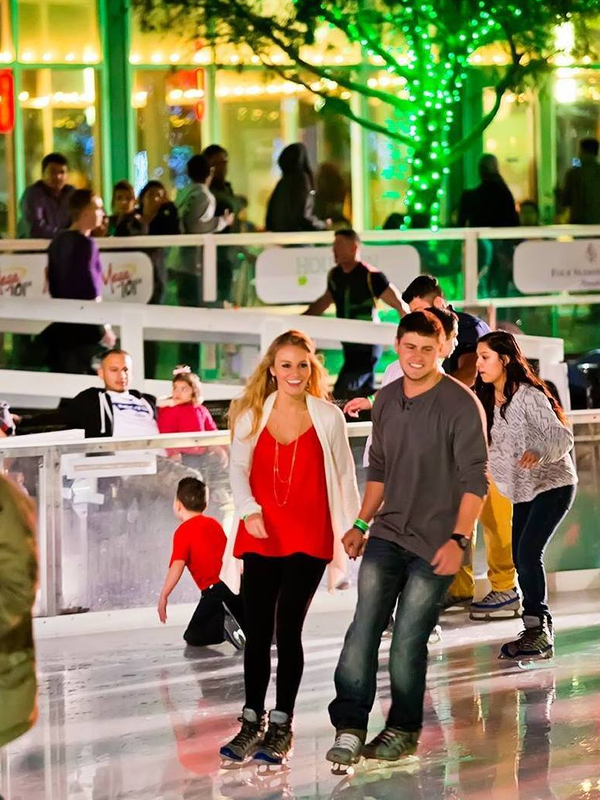 Look for special themed skate days and nights including Time Warp Tuesday skating through the music decades, date night Wednesdays and live DJ jamming on Funfetti Fridays. And yes, ICE will be open Christmas Eve and Day and New Years Eve and Day. Begin or end that Wednesday date night with a kiss under the largest mistletoe ball in Texas, and then try the most romantic gesture of all, hashtagging that smooch #XOmistletoe on your social media channel of choice. Quite a few unique shops have, well, sprung up downtown in the last year. Two in particular Make (her) Boutique at GreenStreet and Launch at Partnership Tower might offer that hard to find holiday gift from curated selections of clothing, accessory, beauty and home items from local designers. The mid-day, Wednesday market runs until December 20th and while many in the crowd are looking for a quick, healthy lunch, you just might find some surprisingly great holiday party and gift exchange presents (honey, olive oil, fresh breads and homemade soaps) amid the local venders. 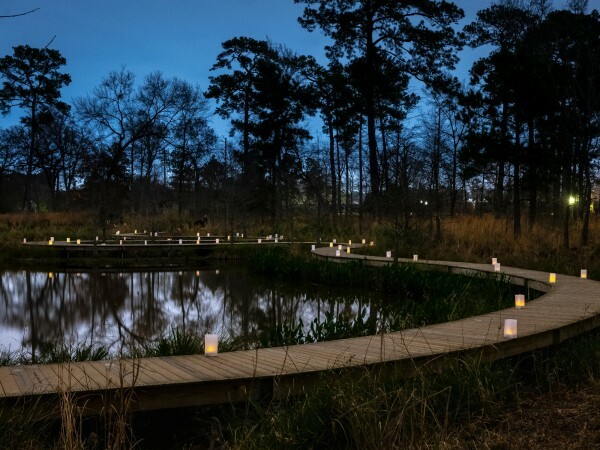 Find the perfect present or just come for a lovely night in the park on December 21. 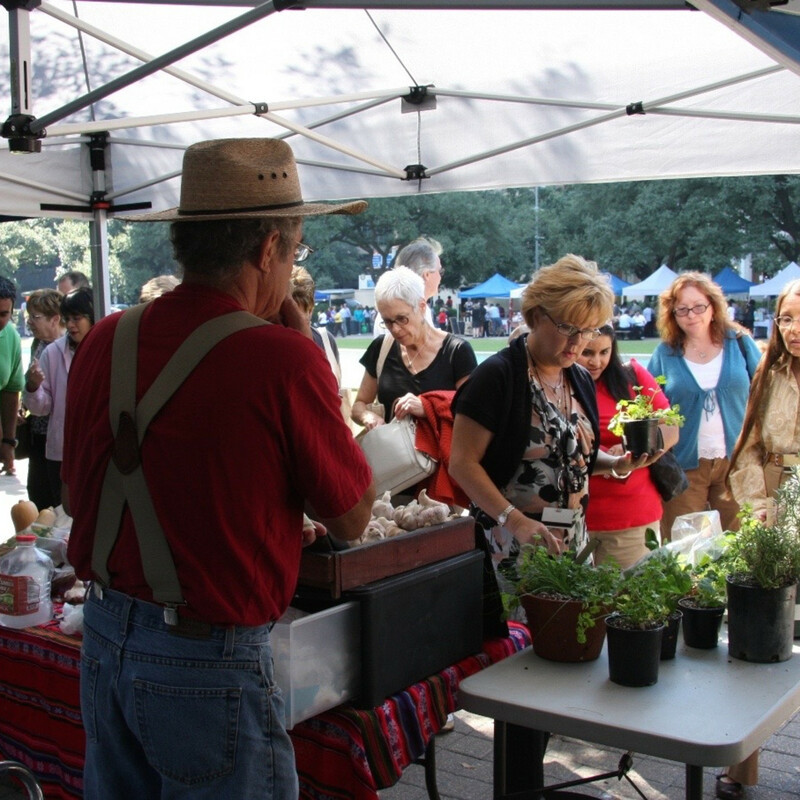 The Discovery Green monthly event offers shoppers quite the deal on artful kitsch, vintage items, mid-century modern furniture, recycled and repurposed items and collectibles, and crafts by local artisans and designers. 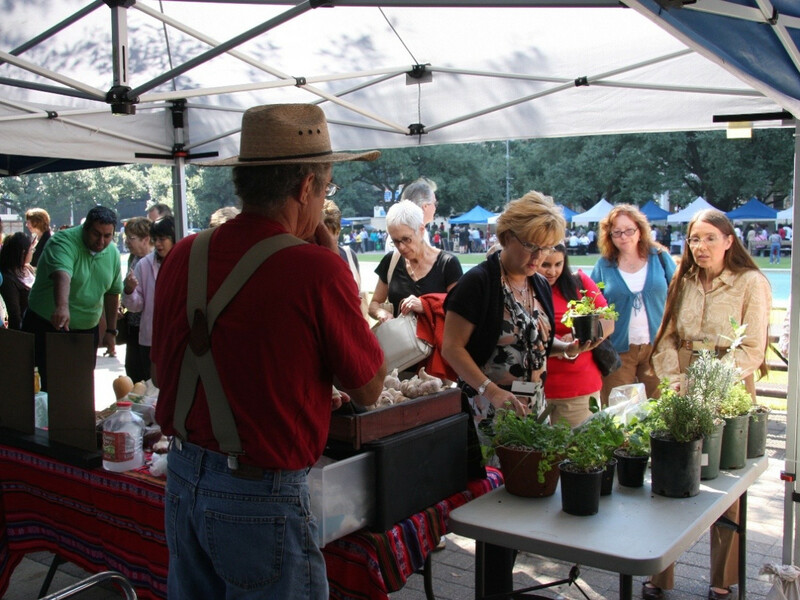 Take those out-of-town guests on a discovery tour and learn something new about your hometown. From Segway jaunts among the downtown towers to a Heritage Society trip back in time through Houston historic homes in Sam Houston Park to behind-the-scenes peeks into Minute Maid Park or the Saint Arnold Brewing Company there’s a lot of Houston untold history to explore. Transportation tip: for a free ride between the best downtown destinations, hop on the Greenlink.